No color in the set of a makeup artist causes so many doubts and fears (understandably so) as yellow. It seems difficult even to imagine how you can apply this color on your face. What will it be—a shocking evening image or a carnival mask for a theatrical stage? In fact, it could be anything—a challenge, a tasteless prank, a delightful sunny image, an inspiring mood in a gray weekday. It is all up to us. It is said that if you don't try what you've never done before, you will never get what you never had. This can be fully applied to yellow makeup. If other colors can make your face more attractive, more desirable and more stylish, the color yellow is able to make it quite different, significantly changing your appearance and your inner energy. When creating an image using the color yellow, first of all, you should consider the places you are going. If it's the office or school, you'd better give up this idea, even if there is a meeting with a person whom you want to surprise and interest. You will perhaps surprise him, but, alas, not in your favor. Let's postpone the riot of yellow color for the night; the sun does not like competitors. The second thing you need to know is the importance of an accurate selection of yellow color in combination with other colors used in the makeup, and in accordance with your own skin tone, hair, and eye color. Yellow is not that easy! It might take revenge when going for a casual look, mercilessly exposing and highlighting carefully hidden flaws in your appearance. But the result of a competent handling of yellow is worth being inspired and experimented with. Due to an extensive palette of yellow shades (from soft vanilla to poisonous lemon and honey), it is possible to choose from a range perfectly suitable for almost everyone. 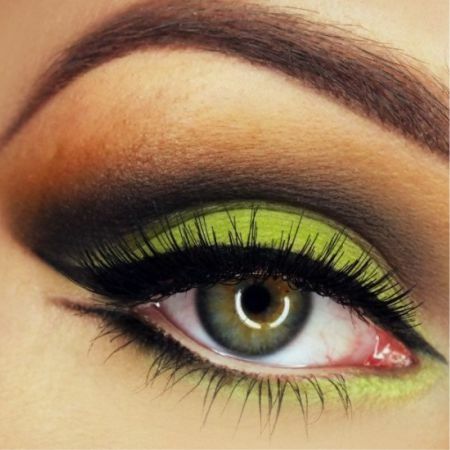 Do not use only yellow eye shadows, creating a mono-effect; combination with other colors will be much more effective. If you have brown hair, choose shades of medium color intensity. Yellow matches with green, brown, lilac and purple, but not very bright shades. Women with green eyes and brown hair shouldn't include blue in their makeup kit. Bright and a bit invidious, a combination of yellow and terracotta, turquoise, purple, lilac, dark green, and blue is good for brunettes with brown eyes. Use brown shades carefully. Blondes with bright eyes should experiment with pale yellow shades, increasing their effect with a subtle contrast line. Brown eyeliner is preferred. Beige and bronze shades of blush look advantageous with yellow eye shadows, and lipstick should be chosen from the same palette. Feel free to use powder containing golden sparkles, but don't overdo it. 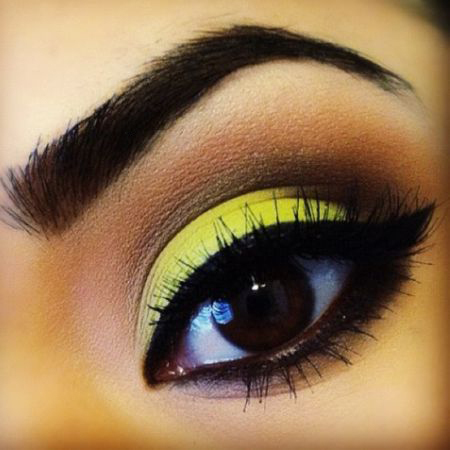 Since yellow makeup provides for a festive evening out, you can approach the creation of the whole image more easily. Yellow should definitely find an echo in the accessories. In this case you'd better avoid the combination of yellow and black, not to look like a bee and cause smiles. Also, your image should exude a positive and sunny mood, you have to be dazzling. However, stop the urge to put on a dazzling yellow dress this evening. One detail, one nuance, one element will suffice. A yellow dress is insidious, even if it fits you perfectly. It will mercilessly display all the skins flaws, every wrong smear of a foundation or a coat of powder that is applied imperfectly. If you still decide to be bright until the end and put on a yellow dress, use eye shadows with sparkles or a golden tint to highlight the eyes. This advice does not apply if the dress is sewn from iridescent fabric. Do not wear gold and silver jewelry if you choose yellow makeup. They will look tasteless, cheap, and out of place. Like the article «Sunny Makeup—The Yellow Color of Optimism»? Share it with friends!